Trail Running magazine is the UK's number 1 magazine devoted to the exciting, adventurous world of off-road running. 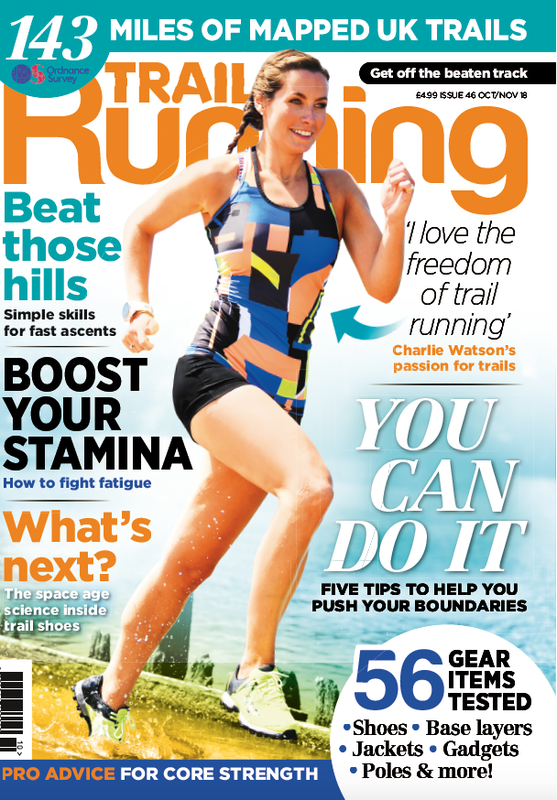 If you're bored of the treadmill, fed up of pounding pavements and want to enjoy running in beautiful parks, hills and mountainsides in the UK and abroad, Trail Running is the magazine for you. Click here to buy a single issue or click here to subscribe and save money. Or pick up your copy today - Trail Running is sold in Morrisons, WHSmith, Asda, Sainsbury's, Tesco, selected Waitrose and all good newsagents. Click here for a FREE read of the Oct/Nov16 issue online. Get the latest edition of Trail Running for 116 pages which will give you the motivation to get you out of the door on a cold winter’s day, plus our free 36-page supplement to launch #Run1000Miles 2019. Kit bag - the gear set to make its mark in 2019. All the regulars, including health news, #trailshoeselfies, training Q&A, training advice, product reviews, routes and trail news. The next issue is out on March 7. Are you Trail Running mag's next top model? Trail Running magazine is the UK's number 1 magazine devoted to the exciting, adventurous world of off-road running. If you're bored of the treadmill and fed up of pounding the pavements click here to buy a single issue or click here to subscribe and save money! Or pick up your copy today - Trail Running is sold in Morrisons, WHSmith, Asda, Sainsbury's, Tesco, selected Waitress and all good newsagents. Trail Running is staffed by people who genuinely love the sport and everything outdoors. Editor Paul Larkins is a former international middle-distance runner who has spent most of his career running on the trails. He has run across the Grand Canyon rim to rim, up the Pike Peaks, and now spends most of his lunchtimes striding along the banks of the River Nene. Staff writer Paul Halford has competed for Wales in the Commonwealth Trail Championships and one of his most memorable experiences was running the Himalayan 100-Mile Stage Race. Whether you're a complete running newbie, a club runner looking for your next challenge, a seasoned mountain marathoner, ultra enthusiast or adventure racer, Trail Running magazine has something for you. We've got expert off-road training advice, inspirational features, trail news, celeb interviews, off-road running route maps, gear tests, great competitions, muddy race listings and much much more!